The Isle of Wight ferry provides the perfect route to England’s largest and second most populous island. The home to famous music festivals and beautiful scenery and coastline, the isle has been a favoured holiday destination since Victorian times. 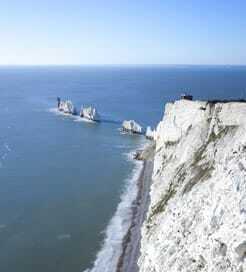 Situated in the English Channel and separated by the Solent, it lies just four miles from the Hampshire coast. How long is the ferry to Isle of Wight? The IOW ferry is a short trip with some of the journeys to and from the mainland taking as little as 10 minutes to complete. You’ll find a ferry crossing to Isle of Wight all year round. 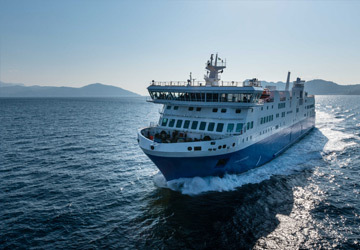 Ferries to the Isle of Wight represent some of the quickest and most regular connections in Britain, with up to 30 sailings every day to a few ports on the north coast, from Portsmouth and Lymington. Not only that, the Southsea/Ryde crossing is operated by the world’s longest running commercial hovercraft company, offering an unforgettable experience. How much is ferry to Isle of Wight? Isle of Wight ferry prices vary but you can find the best deals and times on our website. It’s not just a walk on passenger route as car ferry travel available. Make sure you use our handy search tool to see what Isle of Wight ferry deals are on offer. Sign up for our email newsletter and follow our social media accounts for more exclusive deals. What to do on the island? The Isle of Wight has plenty on offer for those who love the great outdoors. Cowes is famed for its yachting centre, while an extensive network of cycling and walking routes meander through the lush landscape, offering sumptuous coastal views atop quintessentially British white cliffs. A mild climate and 25 miles’ worth of golden beaches make it an undeniably appealing summer hotspot. Dubbed ‘the UK’s holiday island’ and the ‘Dinosaur Capital of Britain’, the Isle of Wight is popular for many types of excursions, all year round. Its prehistoric-themed nickname derives from its high density of dinosaur fossils. Over 25 different species have been discovered to once roam the island, making it one of the richest areas for fossils in Europe. "Excellent service but too expensive." The service is excellent but the costs is too high. I realised it was around 20% of my whole spend. They need to lower the price in my opinion. The stay on the Isle of Wight was Brilliant. "Lying ton to IOW Ocober 2016"
Good website. Emailed about parking and got a quick helpful response. Parking facilities at the port were good Signposting in car park could be improved. Could not pay by credit card at machine and notice directing you to office to make payment but poor signage with directions to said office. Ferries were punctual and clean with cheerful helpful staff both ways . Would be happy to use again and recommend. This ferry trip was very relaxed, easy and enjoyable. Our three young children loved it. Good coffee and sitting area at the departure lounge and onboard. Great views, comfy seats and helpful information about places on the Isle of Wight. We were early getting to the ferry and offered an earlier return trip which was great service. For more information, please visit our Ferries from England to Isle of Wight page.